DIY Newlyweds: DIY Home Decorating Ideas & Projects: Chocolate Covered What? Growing up, my Mom made delicious chocolate candies that were totally the bee's knees. I haven't had them in about 15 years, but after tasting a similar candy recently, I was reminded of my Mom's chocolates and had to make them myself... immediately (as in I ran out to the store the very next day to buy all of the ingredients and made them. This is serious stuff, people). Tasting one of these bad boys, you'd never guess what the delicious secret ingredient is. In fact, after making the candies I had several people try them and love them, but no one could guess how they were made. But believe it or not, my favorite chocolates are made with....dried plums, also known as prunes! Sure, prunes aren't the sexiest thing, but they are actually quite tasty, especially when they are chocolate covered prunes! Chocolate dipped prunes are a favorite Russian recipe and I recently learned they are very popular in Poland and other Eastern European countries, sometimes being called Polish Chocolate Plums or Sliwka Naleczowska w Czekoladzie as they're known in Polish. Not only are they super tasty, but chocolate covered prunes are very easy to make. I really recommend giving it a try! - Prepare by lining a cookie sheet or plate with foil. - (Optional) If you'd like a more jelly-like filling, steam the prunes until soft in a double broiler. 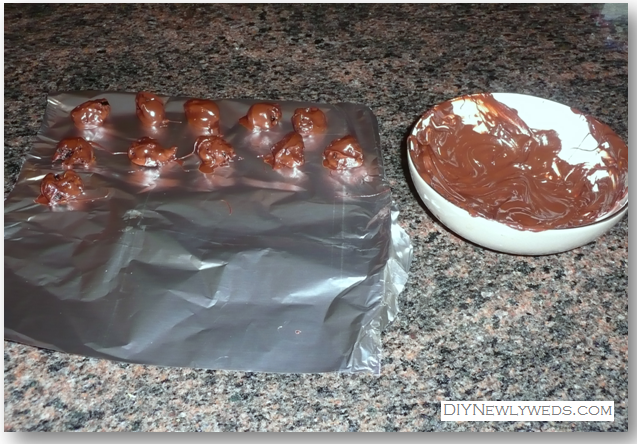 - Melt chocolate chips in the microwave. Stir every 30 seconds to prevent chocolate from burning. - Insert one almond into each prune. There will already be a hole where the pit was removed. - Use a toothpick to dip the prune into the melted chocolate. Cover the prune completely. - Place dipped prunes on foil and place in refrigerator for at least 30 mins to chill. - Surprise your friends and enjoy! - Store chocolates you don't immediately gobble up in the refrigerator.